The big apple, New Amsterdam, the city that never sleeps- all names that are associated with this great city. Once the capital of America, it is a regular on top 10 lists and an obvious tourist magnet. Besides possessing iconic buildings like the Empire State and Chrysler building, it is home to a diverse range of cultures, food, art, street fairs and parks. There are also loads of fun facts about it. One of my favorite neighborhoods, Battery Park City, is entirely man made using a a process called land reclamation because Manhattan needed more land! A typical tourist itinerary includes a visit to the Times Square, Empire State, Rockefeller Center, the Financial District, site of the Twin Towers, Statue of Liberty, the Met, the Brooklyn Bridge and Central Park. And that is all just Manhattan! But there are so many other gems that we New Yorkers are still discovering and so it makes it nearly impossible to see NYC in a week let alone a weekend. I wanted to highlight some not so obvious sights that I have come across while discovering my city. When I tried to say goodbye to New York before heading to the UK, Z and I planned a tourist day and this was our first stop. 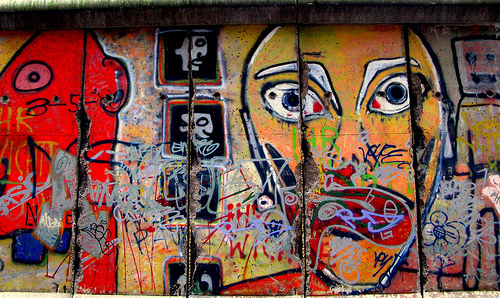 There is a piece of Berlin wall hidden away in the midtown and the graffiti is def worth a second look. Although, it isn’t worth a special trip, it is a cool find and can be enjoyed with a plate of lamb and rice from the nearby award winning cart guy. 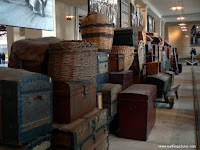 During another outing, we decided to finally visit Ellis Island and absolutely loved it and everything inside. It was amazing to be there and to know that this was the first place immigrants use to pass thru before entering the Island. They have an archive there that allows you to search for your own ancestors and thus making the experience more personal. There also rooms filled with things people came with and it was interesting to see what were considered prized possessions at the time. There are also many activities that can just be enjoyed like the High line, movie nights under the stars and Shakespeare in the park. Then there are other treasures like Williamsburg, MoMa, and the Tenement museum. And of course food here deserves its very own list! I try to make an effort to continue to see new things and know the list will never run out!